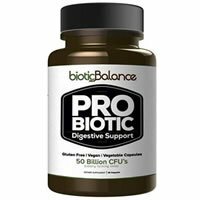 Overall, I really don’t like Biotic Balance Probiotic and give it 1 out of 5 stars. This probiotic just completely misses the mark for me and I’m not impressed with it. To begin, it’s incredibly expensive, coming in at over $55 for a 1-month supply. That’s way more than your average probiotic, even ones for specific ailments. To make matters worse, the website is SO sales-y. I don’t appreciate these types of sites at all. They try to upsell you with really over priced bundles. You’re also forced into a subscription and you can’t just buy one bottle! It automatically enrolls you in monthly billing. I really don’t like this at all. The probiotic itself is super potent and goes overboard. It has way too many cells and strains. With probiotics, too many of a good thing can potentially lead to side effects (which I experienced). I had stomach pain and uncomfortable bloating. I also didn’t feel any improvement after taking it. Some of the only things I like about this probiotic is that it’s gluten free, vegetarian, and vegan. So, that’s why I give it 1/5 stars. Each capsule has 50 billion CFUs in 10 different probiotic strains. I like that L. plantarum is used in the lineup. This strain may be able to help with Irritable Bowel Syndrome (IBS) symptoms such as gas, bloating, and constipation. It may also help boost immune function. One strain that’s used that I don’t like is Lactobacillus casei. This particular strain has been known to be rather overpowering and can even overrun the good bacteria. Biotic Balance Probiotic doesn’t list any allergy concerns. All it says it that it’s gluten free, vegan, and vegetarian. I really wish it mentioned the other major allergens. If you’re very allergic to something, maybe be careful with this one or opt for one that you can trust 100%. The other ingredients include: vegetable cellulose (capsule) and magnesium stearate. The price for a 30 capsule bottle is $47.95. However, you have to pay $7.95 for shipping, so it ends up being $55.90 total. That works out to $1.86 per day to take these. Over $55 just gets you a 1-month supply of probiotics. I don’t think that’s a good price for the value at all. I honestly felt like it was a waste of money. I saw side effects while taking this probiotic. It’s really potent and goes overboard in my opinion. I had belly pain and bloating and it wasn’t comfortable. Be cautious with this probiotic because it’s definitely not suitable as a daily supplement. There’s a 30-day, 100% money back guarantee for Biotic Balance Probiotic. If at any point within the 30 days you aren’t happy with the product, you can return it and get a full refund (minus shipping costs). It’s kind of a pain though because you have to call their customer service department to get the return started. I really appreciate the guarantee (especially since the product is super expensive) but it would’ve been a lot more convenient if you could email in. To buy Biotic Balance Probiotic, click here.